The treatise is organized into nine major topics, comprising 93 blackletter sections that elucidate all the major doctrines relating to how past decisions guide future ones in our common-law system. The authors' goal was to make the book theoretically sound, historically illuminating, and relentlessly practical. The breadth and depth of research involved in producing the book will be immediately apparent to anyone who browses its pages and glances over the footnotes: it would have been all but impossible for any single author to canvass the literature so comprehensively and then distill the concepts so cohesively into a single authoritative volume. More than 2,500 illustrative cases discussed or cited in the text illuminate the points covered in each section and demonstrate the law's development over several centuries. 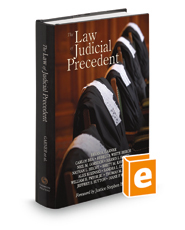 The cases are explained in a clear, commonsense way, making the book accessible to anyone seeking to understand the role of precedents in American law. Never before have so many eminent coauthors produced a single lawbook without signed sections, but instead writing with a single voice. Whether you are a judge, a lawyer, a law student, or even a nonlawyer curious about how our legal system works, you're sure to find enlightening, helpful, and sometimes surprising insights into our system of justice.